Six distinctive features in each picnic table plan. 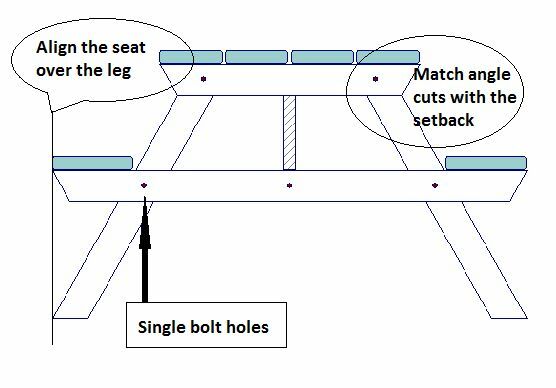 Aligning the seat over the leg reduces the risk of the table tipping when one side of the table is weighed down heavier than the seat on the other side of the table. The program will first attempt to position the leg as shown in this illustration. If other design criteria won't allow this condition then the leg will move inward and the program will display an estimated table tipping risk percentage. The table and seat support angle is the same as the leg angle. Having just one angle instead of several angles makes cutting the table components much easier and faster. This also enhances the overall aesthetics of the table. The challenge here was to match the table support angle with the leg angle ensuring the table support angle setback meets the leg as shown here. The angle is found using a trigonometric formula composed by the software developer, David Eidsness. The single bolt holes allow for quick and easy assembly without block jigs or other techniques and measurements. The plan includes exact measurement locations for the holes. Additional holes may weaken the strength of the supporting members however screws around the bolts is recommended to strengthen the connection allowing slight flexibility without compromising the stress point. The greater the angle the longer the cut. This will result in the table brace extending down below the support member it attaches to. This won't affect the strength of the table but may not be visually acceptable to the builder. The program has an optional "auto size" function if the designer decides to resize the brace member width to match the support width as shown here. 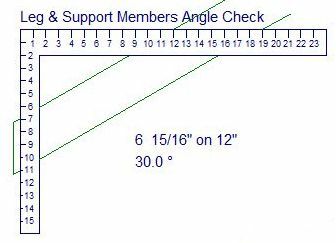 Illustrated angle checking is included in the plans for the two angles used in each design. One angle is for the table braces and the other angle is for the rest of the cuts. Each picnic table design only uses two angles. One angle is for the table braces and the other angle is for everything else, namely, the table legs, seat supports and the table top supports. 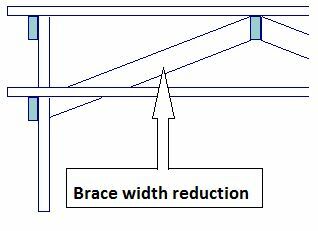 This diagonal brace design transfers loads through the centre table support to increase table strength by evenly distributing triangular stress moments including shock loads caused from table relocations. This helps reduce the risk of table end support assemblies coming loose and/or failing completely. This design also helps prevent the table top members from warping downward over time.